So your favourite newsgroup or mailing list has become infected with people listing seemingly random London Underground stations, each annotated with justification to a rule that no-one's mentioned before. They're playing some sort of game! But oddly enough, they can't tell you where you can find a copy of the rules. And you've done a search for the rules, but with no success - you seemed close one time, but ended up on a 404. Hopefully, you also found this page. The reason you didn't succeed is the obvious one. There are no rules to Mornington Crescent. That is to say, there is no shared rulebook from which the rules people quote are drawn. It's all improvised as the players go along, and has been since the game was invented for the BBC Radio 4 comedy panel game "I'm Sorry, I Haven't a Clue" many decades ago. In that tradition, it is a harmless bit of surrealist improvisational comedy that draws on the poetry of London Underground station names (from "Fairlop" to "Mudchute") and the shared experience of arguing over the rules of too-complex boardgames on Christmas Day. But it has long been a tradition that players must never admit that this is what's really going on - the usual answer when asked is "oh, just watch us play for a while, you'll pick the rules up". Unfortunately, this tradition appeals to the cliquery of some insecure people in a very obnoxious way. Lacking the comic talent of a Willie Rushton or Graeme Garden, for them the main appeal of the game becomes the feeling of superiority over those who are seeing the game played for the first time, and the warm feeling of being in the clique that knows the secret. 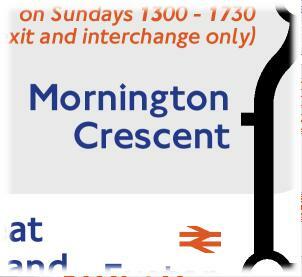 For them, Mornington Crescent is no more than a socially acceptable form of trolling. Some of these players will even go so far as to insist, even in private email, that the rules being quoted are real rules drawn from a real shared rulebook that the original Radio 4 players used; they do this mainly in the hope of keeping you out of the clique and thereby demonstrating their superiority over you in some insignificant matter. It's clear that this assertion does not stand to reason: first, because the myriad of strange exceptions being quoted would seem to indicate that the rules are way too complex to pick up, and second because it's pretty much unimaginable that any game so popular on the Internet should lack an easily-found Web page which gives a clear explanation of what the rules are, especially when you come to wonder how everyone else found out about the Einstein/Tchaikovsky rule of 1963 regarding Fenchurch St. However, if you really want to convince yourself, the easiest way is to make a move in the true spirit of the game. Don't feel constrained to London Underground Stations, so long as you can come up with a justification. For example, ever since the Gardener "cheese" gambit of '84 was ruled legal a move such as "Shirokane-Takanawa" (on both the Mita and Nanboku lines of the Tokyo Subway) would be perfectly legitimate so long as the previous move was to a Northern Line station with a "k" in the name. Or move to Milan Kundera's "The Unbearable Lightness of Being" - with Parliament suspended for the General Election, the "penumbra" rule takes on a whole new meaning! Alternatively still, quibble with someone else's move - point out that they didn't declare blanket on their previous move so they can hardly move to a rail interchange station now. The more surreal the better, and for three reasons. First, because the fact that no-one balks at the surreality of your move, or the utter fabrication of the rule that justifies it, should surely be the best testimony to the nonexistance of any rulebook. Second, because the only real rule is that you can do what you like, so long as you're witty with it. But third, because it will make it far easier for onlookers to pick up on what the rules really are, and thus kill off the "clique-style" playing which otherwise tends to dominate; to that end, you are also duty-bound to pass on the URL for this article to anyone else you see enquiring about the rules, even if only in private email. In writing this, I'm breaking a taboo on explicitly mentioning this aspect of the game. I'm sorry if this spoils the fun of the honest players. But I get so incensed by the rudeness of those who play to laugh at the uninitiated that I think the world needs some easily-found, straightforwardly worded resource by which all can become enlightened. Earlier, more vituperative version of this article. Probably funnier and less sincere than this version; written before I chatted to the more reasonable kind of Mornington Crescent player. A rebuttal to the earlier version of this article. I'm Sorry I Haven't a Clue home page. Many thanks to the drunkbis for their commentary on the earlier version of this article.